I’m Just Like Seabiscuit! 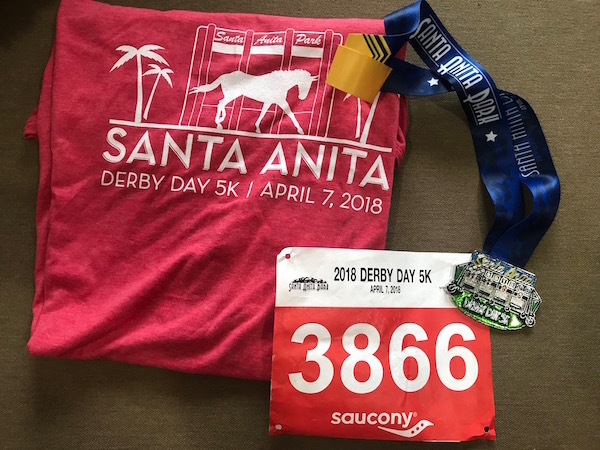 (Derby Day 5K Race Recap) | Keep It Up, David! 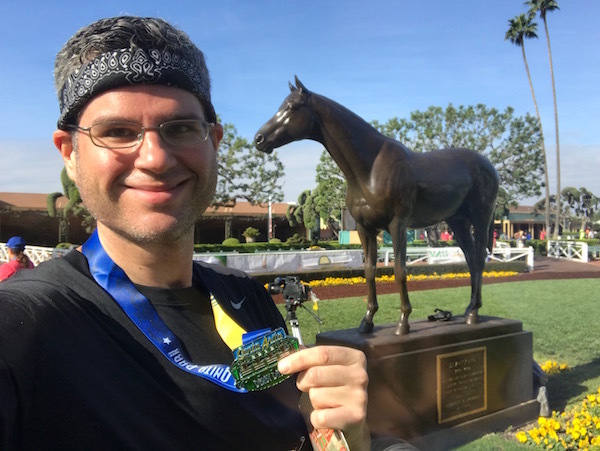 Here’s something you don’t see every day: a 5K race that starts by running through the very same starting gates that horses use at one of the most famous horse racing venues in the country! 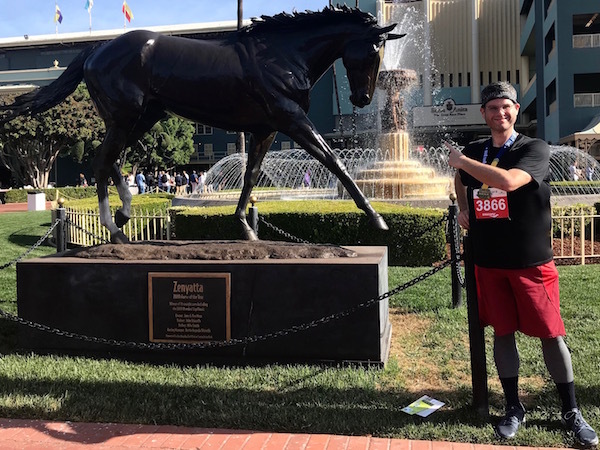 The race was the Derby Day 5K, held at Santa Anita Park, a thoroughbred racetrack in the Los Angeles suburb of Arcadia. 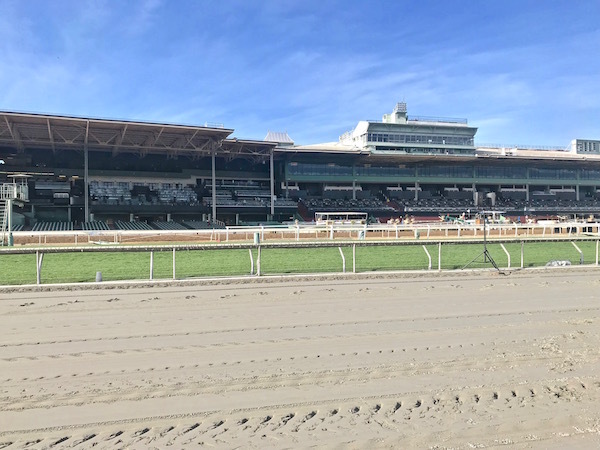 Built in 1934, Santa Anita Park hosts its own races, and has also hosted the Breeders’ Cup nine times, more than any other venue. It’s enormous, with the grandstands capable of holding more than 60,000 fans. 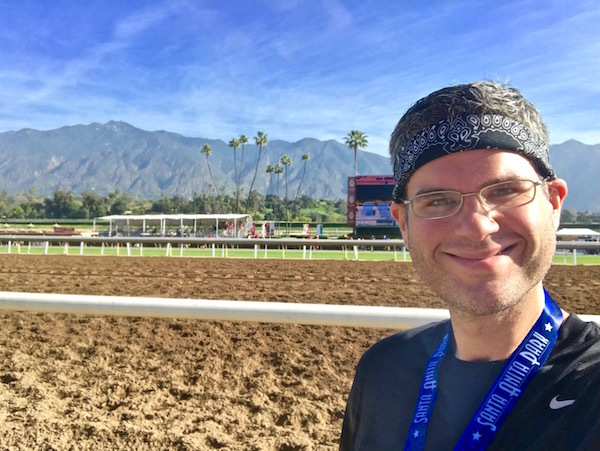 I don’t know a lick about horse racing, but I learned, before doing this race, that this race track is where Seabiscuit won his last race, in 1940. It’s where scenes in the “Seabiscuit” film were shot, too, as well as “The Story of Seabiscuit,” a Shirley Temple film from 1949. 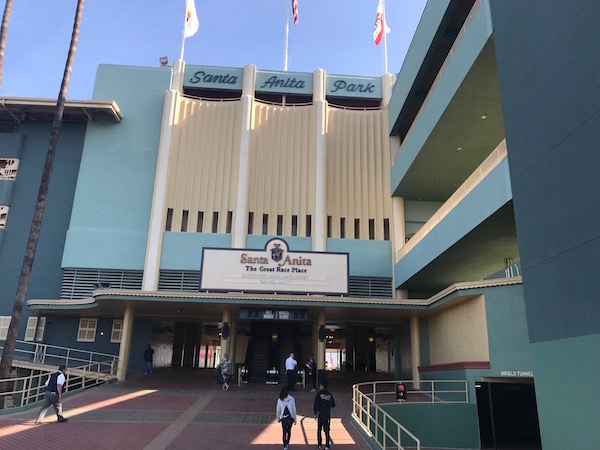 On a sadder note, Santa Anita Park was used as an temporary internment camp for Japanese Americans during World War II, with over 18,000 people living in horse stables and barracks built on the grounds. One of them was “Star Trek” actor George Takei, 5 years old at the time, before he and his family were transferred to another camp in Arkansas. The starting line for the race was in the corner of the huge parking lot, and they wheeled the starting gates out there for us to run through. We lined up in waves based on how fast we ran a mile. 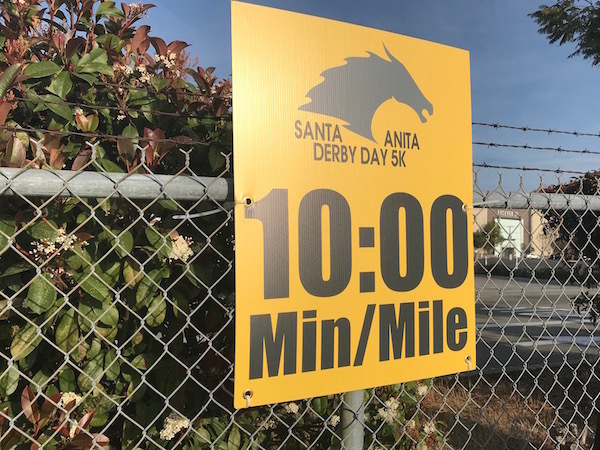 I had averaged 9:55 per mile at my most recent 5K, the Tustin Hangar race just a few weeks ago, so I placed myself in the 10:00 min/mile group. The race started around 8am, with waves going every two minutes. 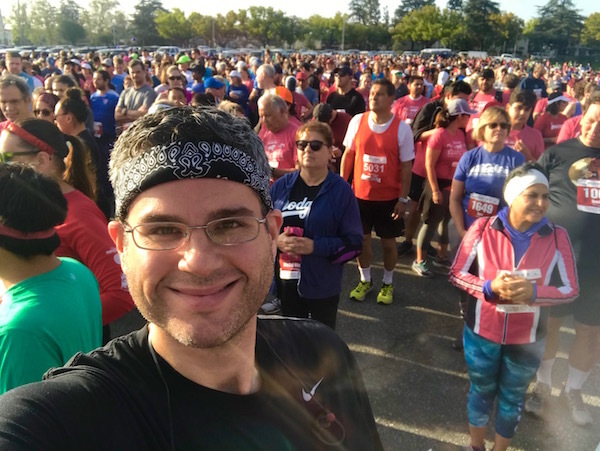 There were nearly 5,000 runners in attendance: a huge crowd! And this is only less than half of them! Once one wave started, the next moved up and into place behind the starting gates. 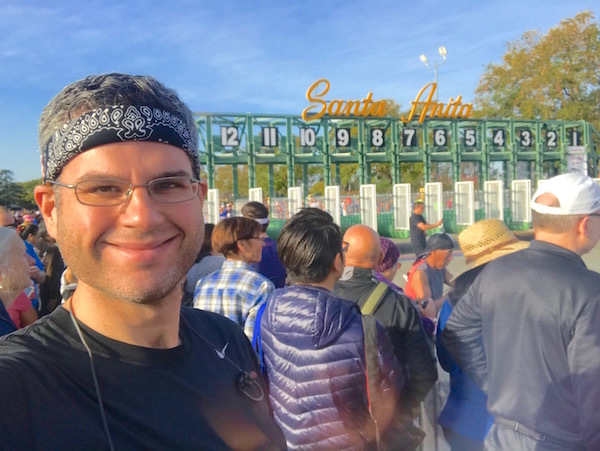 I took a little video when I ran through the gates, which I posted on Facebook and you can watch here. I felt like Seabiscuit! I really liked the course for this race. The first part was the boring part – through the parking lot and alongside the back of the Santa Anita Mall. But then we crossed Baldwin Avenue and entered the Los Angeles County Arboretum and Botanical Gardens, and it was gorgeous: trees, manicured gardens, fountains and ponds. I kept an eye out for the dozens of peacocks that roam the grounds, but didn’t see any. Perhaps 5,000 people running through their backyard scared them off. I had forgotten how great it was to run in a wave of similarly-paced runners. I don’t think I’ve done a non-stair race organized this way since the Bolder Boulder 10K in 2012. (Holy crap, was that really six years ago?) Most races have a mass start, where faster runners congregate towards the front and slower folks towards the back, but it’s a big hodge-podge. There’s less bobbing and weaving when you’re running alongside people who are more or less your speed, making it easier to maintain your desired pace. After exiting the arboretum, we crossed Baldwin again and reentered Santa Anita Park through the back way, past horse stables, support vehicles, and loading docks. It smelled like manure, but it was neat to see all the equipment (like a hay baler) and space necessary to keep hundreds of horses around. From there we dipped down through a small tunnel and emerged behind the track. The grandstand loomed in the distance, off to our right, and after another 1/2 mile, we entered another, longer tunnel that took us under the race track and onto the infield. 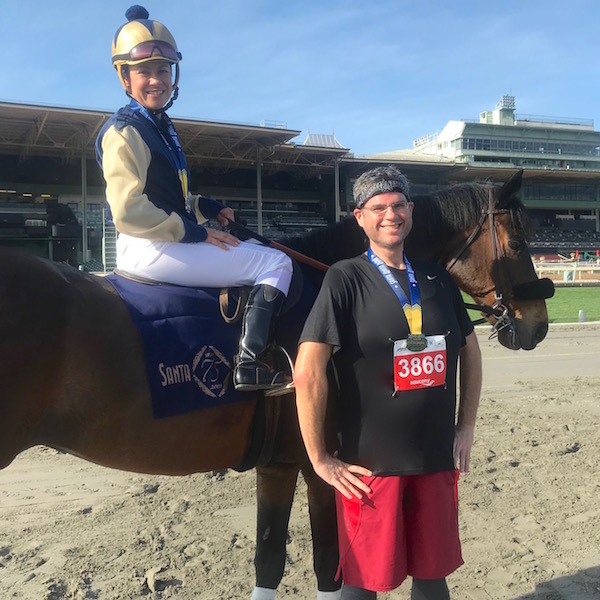 We skirted around some concession stands and picnic areas, and for the final 1/4 mile, we ran on the actual track, in the same soft clay as Seabiscuit and all the other ponies for the past 80 years. While it was exciting to be on the actual race track, it was also tough, because running on squishy clay is harder than running on pavement. But the finish line was in sight, so I tried not to think about it, and powered through for a strong finish. Success! Man, those grandstands are enormous – and I could only fit about half of them in one shot! It really is a beautiful setting. When you’re sitting in the stands, you’re looking up at the San Gabriel Mountains rising up in the distance – not a bad view at all! I had signed up to have my time texted to me after the race, and a couple minutes after crossing the finish line, I heard a ping, and there were my results. 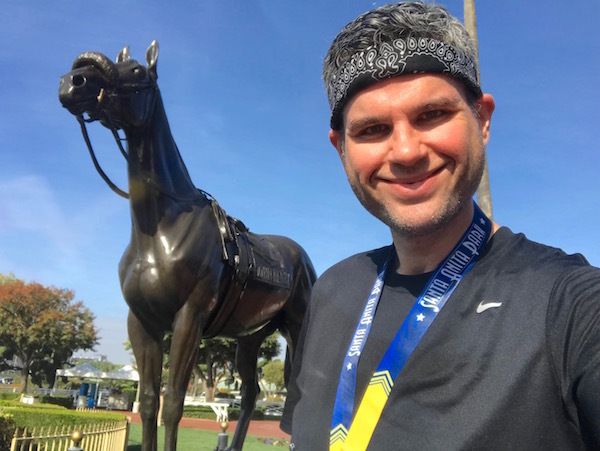 I ran the Derby Day 5K in 29:15. WHOA! That’s a PR! 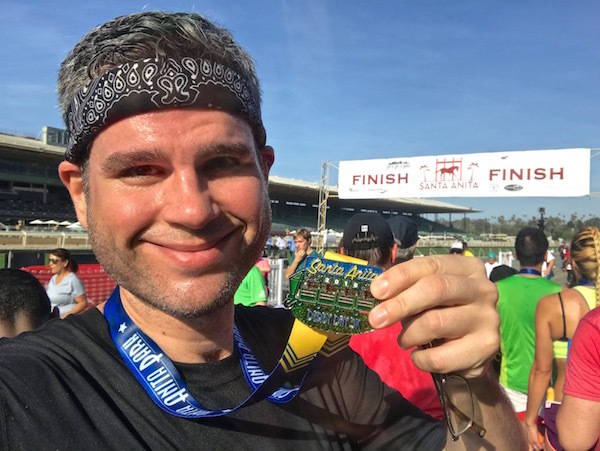 I finished 774 out of 4,752 finishers – 83rd percentile! I finished 524 out of 1,966 men – 74th percentile! I finished 260 out of 812 in my division (Men 35-39) – 68th percentile! And I met an actual racehorse! This is Freckles. I didn’t ask the jockey’s name, but she was a very nice woman. I love my finisher’s medal, and I love that the race t-shirt is pink. I get tons of race t-shirts, and so many of them are grey or black. One does want a hint of color! This entry was posted on Monday, April 9th, 2018 at 12:09 am and is filed under Uncategorized. You can follow any responses to this entry through the RSS 2.0 feed. You can leave a response, or trackback from your own site. Congrats on the PR. It won’t be your last. The first time you break the thirty minute 5K barrier is inspiring, it makes you hungry for more. I have played the horses off and on for thirty five years. SA has always been one of my favorite tracks. All the California tracks are on my list but SA has a special place in my heart. It helps that the weather and track conditions are almost always perfect and early pace matters. The SA 6.5F downhill turf course is unique in all the world. I am heading for the seven mile bridge run in Florida. It is this coming Saturday. Wish me luck! Thanks! I don’t have much hunger at all for running, but a good race is a good race. 5 and 10k races help fill some gaps between stair events. Best of luck this Saturday with the bridge – sounds fun! I’ll be racing this Saturday too – up lots of stairs! KEEP IT UP!